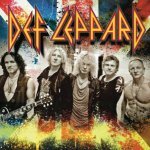 Def Leppard played a show in San Sebastian, Spain on 23rd June and a fifth online review and photos have been posted. Info Rock have posted a review of the show which took place at the Donosti Arena. 40 photos are also included of all three bands. "The huge rear screen, excellent in quality and production of images, alternated live shots and video with beginner to remember the beginning or as a tribute to their guitarist Steve Clark, who died in 1991. The staging was flawless, with screen, good lights and a colorful stage with stairs and walkway that jutted from the audience."